Scott Lane Boatbuilders Odysseia will be on display at the Auckland On Water Boat Show. The Auckland On Water Boat Show is set to display world firsts. From one of the world’s most resilient paint coatings to redesigned catamarans and hand crafted sedans, this year’s Auckland On Water Boat Show has world leading products on show right here in Auckland’s Viaduct Harbour. With the Auckland On Water Boat Show set to kick off in September, New Zealand’s top boating exhibitors are lining up to show off their innovative and advanced products once again. Featuring at the show is one the world’s most resilient paint coating systems, developed by New Plymouth-based Marine Shield. The coatings have been developed to protect sails from the harshest conditions in the world, including New Zealand’s own unrelenting UV environment and Mediterranean red rain, as well as impenetrable protection from mould, mildew, algae and chemical corrosion, all while ensuring the sail stays light and flexible. This video demonstrates just how good these products are – skip through to the four minute mark to see the Marine Shield team do their best to destroy sail cloth with keys, a fork and diesel waste oil. Don’t believe them? The team will be at the boat show challenging you to do your best to scratch the Marine Shield-coated sails. With certified applicators globally, this essential technology is available not only here but worldwide. The products come in a huge range of colours, ensuring your sails not only perform incredibly well but look the part while doing so. Newly-launched Odysseia, built by Scott Lane Boat Builders, is a striking 13-metre sedan commissioned and built to Scott Lane’s exact specifications. After building six motoryachts in the elite Bill Upfold-designed style, Lane decided he should build one for him and his family. Hand-crafted by Lane’s team in their Clevedon workshop, every detail was overseen by the eventual owner; Lane himself. An entry-level launch designed with familial comfort and visibility in mind, Odysseia is majestic yet simple, with spacious berths and a seamless indoor-outdoor flow. Odysseia will be on display for visitors to explore at the show, and the Scott Lane team has her sister ship already under construction at their Papakura workshop. Multihull Solutions will be showcasing the brand new model of the Summerland 40 Long Range power catamaran, and the Lipari 41 sailing catamaran, both by French builder Fountaine Pajot Motor Yachts. 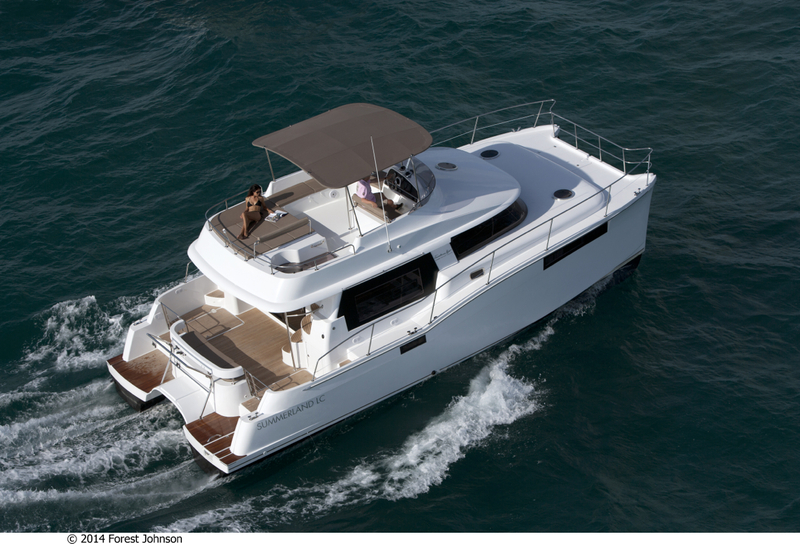 The fuel efficiency of the Summerland 40 Long Range power catamaran elevates it into the top tier of boats its size. Able to travel 1000 miles at 7.5 knots, the Summerland 40 LR is at the top of its field but does not compromise on other features. Automatic controls, immense lounging comfort and panoramic views from inside the boat allow ample time to relax and enjoy the scenery. Privacy between hulls allows guests undisturbed, private cabins after the sun has set on the evening. The Lipari 41, already one of the most popular sailing catamarans, has undergone a spectacular upgrade, solidifying it as the premier cruising multihull. Gloriously spacious and perfect for long journeys, comfort is paramount in the upgraded Lipari. Since its initial launch in 2010, 150 have sold worldwide. Multihull Solutions is unique in that it has sales centres across Australia, New Zealand, Asia and the Pacific Islands, and has a breadth of brands which means it can offer immense choice and leading advice to buyers. The company will not only bring its own experienced personnel to the show, but representatives of all its brands including Fountaine Pajot Motor Yachts, Catana, Sunreef, TAG Yachts, Privilége Catamarans and NEEL Trimarans to ensure show visitors are offered the most comprehensive information about the models which take their interest. The 16th annual Auckland On Water Boat Show takes place from the 25 to the 28 September in the Viaduct Harbour and is New Zealand’s largest on-water boat show. Catering for all on-water passions and providing dozens of experts ready to share their expertise with you, the show cannot be missed, whether you’re a casual boatie or an industry stalwart.